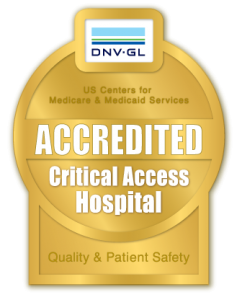 Forks Community Hospital & Clinics are committed to serving all patients, including those who lack health insurance coverage and who cannot pay for all or part of the essential care they receive. We are committed to treating all patients with compassion. 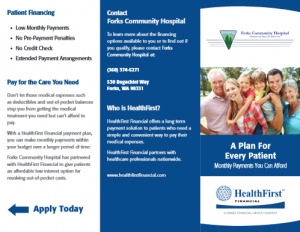 Forks Community Hospital & Clinics Financial Assistance Program provides financial assistance for qualifying patients who need help paying for emergency or medically necessary care they receive in Forks Community Hospital & Clinics. 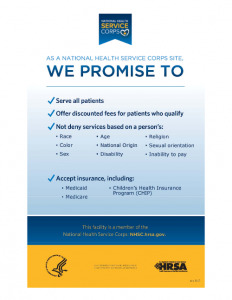 Patients must fill out an application to apply and must meet the eligibility requirements listed below to qualify. Who is eligible for Financial Assistance and what are the requirements? The program helps uninsured or underinsured patients who need help paying for all or part of their medical care. Patients are eligible for Financial Assistance when their Family Income is at or below 300% of the Federal Poverty Guidelines (FPG). Evaluation of other criteria may be required. Patients should consult with a Patient Financial Service Representative at (360) 374-6271 to determine eligibility and for assistance applying. Patients who have experienced a catastrophic event may be eligible under special circumstances, regardless of household income. 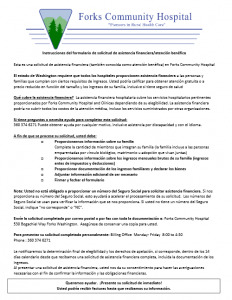 The Financial Assistance Program covers medically necessary care provided at Forks Community Hospital & Clinics. Interpreters are available to you at no cost. The financial assistance application, policy, and this policy summary may be available in your language. 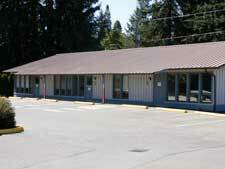 For more information please call (360) 374-6271. 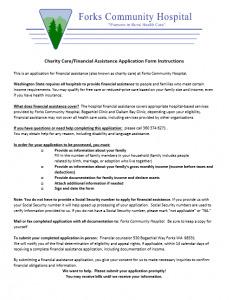 We are able to process submitted applications only once they are complete, and will determine whether you are eligible according to the Forks Community Hospital Financial Assistance Policy. We will not consider incomplete applications, but will notify applicants and provide an opportunity to send the missing documentation or information by the required deadline. For more information about charity care, click here. The Affordable Care Act requires everyone to have health insurance. The goal is to make coverage more accessible and affordable for those who do not currently have health insurance or have limited coverage. Washington State’s Health Benefit Exchange, called Washington Healthplanfinder, allows individuals and families who do not have employer-sponsored health insurance to enroll in a health plan and receive financial help. Health coverage offered through Washington Healthplanfinder includes Apple Health (Medicaid) and various qualified health insurance plans. Enrollment for Qualified Health Plans through the insurance exchange closed March 31; however, enrollment into the Apple Health program is open throughout the year. If you have health coverage through Medicare, you don’t need to do anything. In person: In-person is available to help you enroll in coverage on the Health Benefit Exchange. More information can be found here.